The University of Missouri St. Louis just opened up a new space on their campus dedicated to innovating education. It's called the EdCollabitat. The College of Education turned what used to be an old library into a completely re-designed, modern learning space. The Chancellor of UMSL and the Dean of the College of Education were there to celebrate the opening and tell the story of how UMSL first conceived of this undertaking. Born with the principles of the Stanford D.School in mind, the EdCollabitat will serve as a space to inspire design thinking for everyday problems in education. Design thinking is all about asking the question "What if" to imagine creative new solutions for decade-old problems. The EdCollabitat has three main goals that will guide it's function in the College of Education: to explore possibilities in education, to design and build solutions and to create a plan to implement these new ideas. Within the space there is a collaboration area, a makerspace, and even an area for local edupreneurs to work on their startup education companies in partnership with MasterCard. 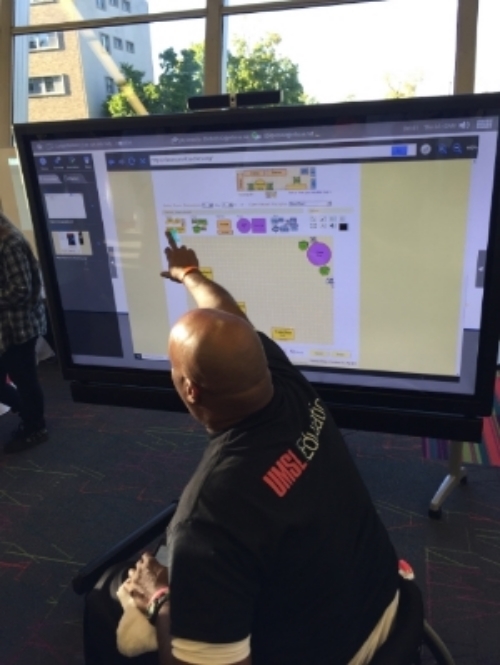 There is no shortage of innovative technologies in the space that also add to the learning inspiration. Robots, drones, a green screen, video games, and more enhance the space and reinforce the EdCollabitat's goals. The most important mission, however, is what the EdCollabitat means for local schools. It represents an opportunity to bring teachers together to collaborate professionally and help elevate the education that students in St. Louis receive. It further represents a new opportunity to connect secondary with higher education. Last night was just the beginning of what lies ahead for the EdCollabitat and the great work being done at UMSL's College of Education. So, go check it out! With the the groundwork in place, the rest of our challenge rested in the hands of the participants and the first step was to empathize. We had the participants learn about each other’s educational backgrounds. In order to overcome the challenges of urban education, and especially given the history of race in St. Louis, it was a critical starting point. We invited all these strangers together to tackle a major issue and in order to work together design thinking requires you put yourselves in each other’s shoes to see the problem from a new perspective. Then, each team had to brainstorm like crazy to create as many solutions to their specific problem. We had so many post-it notes all over the room that showed just how many possibilities are out there to defy our conventional solutions to urban education. After the brainstorming period, we separated the team members to go learn more about the other teams’ solutions. Then, the entire room could fuse together a solution based on all the ideas in the room. Each group then constructed a prototype solution using unconventional materials to convey their solution to the other teams. The first ever Urban Education Design Challenge produced well-defined problems and creative solutions to tackle issues facing St. Louis schools. Connected Learning now looks forward to testing and re-ideating these solutions to improve education for all St. Louis students.